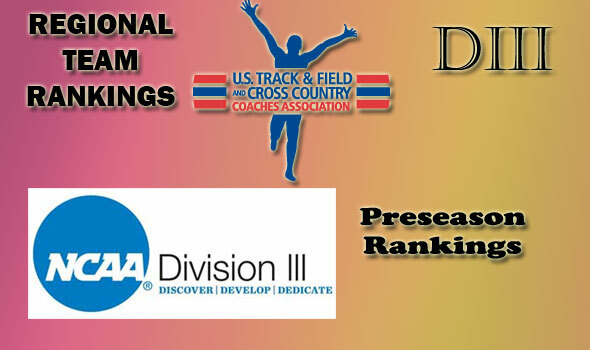 NEW ORLEANS – The U.S. Track & Field and Cross Country Coaches Association (USTFCCCA) announced on Tuesday preseason regional cross country rankings for NCAA Division III. Placed in order by a representative in each region, regional rankings are a reflection of a team’s strengths entering the year based on returning and new runners on each squad. NCAA Regional Championships will take place on November 13 at eight sites. A complete listing can be found here … http://www.ustfccca.org/ustfccca-calendar/future-collegiate-championships. The top-35 teams in the national preseason cross country coaches’ poll in Division III will be released on September 1. The NCAA Division III Cross Country Championships will be held on November 20 in Waverly, Iowa. The next regional rankings will be released on September 7.